While Beijing tries to increase the overseas credibility of its media, China Daily U.S.A. remains sharply political. 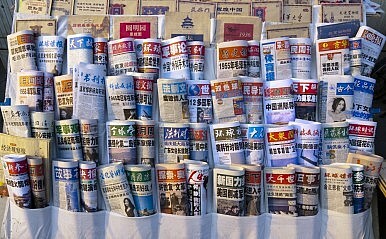 Amid a push by China to increase the credibility of its media in overseas markets, the editorial direction of China’s largest English-language newspaper shows no sign of moving away from its traditional role as a source of pro-government rhetoric. A total of 37 articles were written for China Daily’s editorials section during January, and the vast majority covered one of three topics: Anti-corruption efforts, economic reforms, and Beijing’s foreign and domestic security policy. These three topics are the cornerstone issues of Xi Jinping’s presidency, and Xi received praise in six separate articles for both his anti-corruption efforts or his economic policies. Eleven articles either promoted Chinese foreign and domestic security policy or criticized related Western policies. Discussion of China’s corruption problem was ubiquitous, but limited almost entirely to coverage of corrupt local officials or private enterprises. Corruption at the national level only covered matters that Beijing’s anti-corruption efforts had already begun to address. reason for the ban but cited no specific incidents. A previous tour of the arctic saw a reporter from the People’s Daily removed from the trip after he shoved one of the prime minister’s aides. CCTV’s approach to the United States has been different. In order to appear credible, the U.S. network has recruited respected journalists from major American networks into its ranks. Research by journalism academic Anne Nelson found that reporters at the network feel less pressured to censor their work than those at CCTV Africa. According to Nelson, CCTV America shows that Chinese state-run media is capable of producing high-quality content while using Western-style journalistic standards. Beijing has spent heavily to expand the reach of its state-run media bodies, announcing in 2010 a $6.6 billion dollar plan to create a media empire that will rival the likes of Rupert Murdoch’s News Corp and the BBC. That same year China’s largest state-run news company, Xinhua, moved its North American headquarters to New York’s Times Square, putting it at the center of America’s financial and media capital. Beijing recognizes that a credibility gap persists for its overseas media despite the investments that were outlined above: In August 2014, President Xi Jinping announced his intention to build a Chinese press that is “strong, influential, and credible” on the world stage. The China Daily editorialized that Xi’s plans would “[open a] new chapter for the industry.” If the first month of 2015 is any indication, China Daily USA’s plans to gain credibility do not include embracing Western-style practices as CCTV America has. It remains to be seen whether Xi’s plans for a more globally prominent Chinese media will change this. Jeffrey Cusack is a freelance writer originally from Canada.